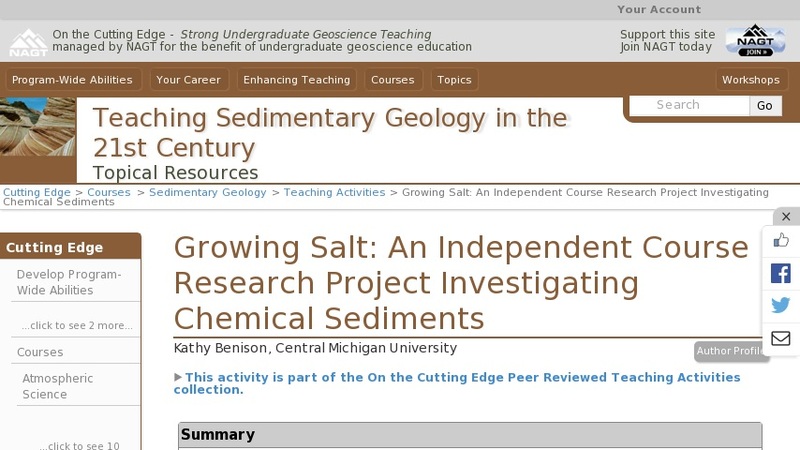 To prepare for this project, students read a journal article about the processes and products of chemical sedimentation and early diagenesis in saline pan environments (Lowenstein and Hardie, 1985). In class, students are given some handouts that tabluate various evaporite minerals and how water chemistry affects their formation and dissolution. A short slide show and video illustrate some different types of saline environments. Photos and samples guide a lecture on the formation of different types of evaporite minerals and how they form. For example, chevron halite crystals are generally large (cm-scale) and grow upward from the floor of a shallow (less than ~0.5 m) surface water body; cumulate halite crystals are smaller (typically mm-scale) and grow on the water-air interface and settle to the bottom, regardless of water depth. Randomly-oriented halite crystals can grow displacively from groundwater in mud or sand. The students learn that the specific sedimentology of halite can be used to trace past surface water depth and groundwater salinity. I also give examples of how past quantitative climate data, past chemical data and even past microbiologial data can be interpreted from evaporites. I emphasize how, in order to understand evaporites, one must think critically about sedimentology and geochemistry. The students are told, at the end of this lecture, that their next lab period will focus on designing and setting up a research project on growing salt. They are encouraged to start thinking about a research question they can pose about evaporite sedimentology. At this time, I also tell them what materials are available for their use (tap water, distilled water, seawater, various types of saline water I have collected during field trips, various types of store-bought table and road salt (including iodized, non-iodized, sea salt, etc.). A variety of table salts can be purchased cheaply (~$1 - $2/carton) at almost any grocery store. If you live in a cold climate, most grocery stores and hardware stores also sell several types of road salt (~$3-$4/bag). The table salts are mostly Na and Cl; some have lesser amopunts of Ca and SO4. Some road salts have Ca, Mg, Na, and Cl. In my experience, one carton and one bag of each type will provide more than enough salt for a class of 15 students. When it is time for lab to begin, I gather my students in my research lab (but could also be done in a classroom), where I show them the materials I have available to them: various types of salt, various types of water, and plastic, glass, and metal containers of various shapes (baby food glass jars, plastic take-out food containers, etc). My lab also contains a variety of other miscellaneous materials, such as sand, gravel, clay, morter and pestle, wooden sticks, metal stirring rods, string, plastic tubing, beakers, food coloring (shows fluid inclusion bands well and everyone loves playing with food coloring), etc. I remind the students that they have a microwave oven, a freezer, a lab hood, a windowsill with plenty of sunlight, and a heating vent that can be used, as well. I make available a few thermometers, pH strips (or pH meter), and a hand-held refractometer for measuring salinity. These analytical field instruments are not neccessary for this assignment to work. However, as instructor, I would encourage you to use anything available to you. I ask each student to tell me informally of their research question/hypothesis and then I try to help them find any materials they need for their experiments. Here are some examples of student research questions that have been tested with this assignment: (1) Does temperature of water affect rate of haite/gypsum growth? : (2) Will evaporite minerals grown from a complex saline fluid form a "bulls eye" pattern as their textbook claims? ; (3) Will halite grow preferentially on glass substrates versus wooden and plastic substrates? ; (4) Will evaporation of salt water make halite cement equally well in a gravel, a sand, a clay? ; (5) What conditions best produce large halite crystals? ; (6) Does pH of water influence halite and gypsum precipitation or dissolution? Students spend most of a lab period (2-3 hours) setting up their experiment. As part of this initial experimental set-up, they start to learn basic research skills such as labelling samples well, documenting starting conditions, and taking detailed notes. The students are allowed to leave their experiments on a windowsill in my lab or our classroom, on a radiator, in a lab fume hood, or in a lab refridgerator or freezer, depending upon the nature of the particular experiment. I encourage the students to check their samples on a daily basis and remind them to record their observations each time they check their experiment. I give the students an assignment sheet that details the final lab report requirements. Most students will have results in 2-3 weeks, but some experiments may last up to 4-5 weeks. For this reason, I plan for this lab assignment to be started in the middle of the semester (which works well if your syllabus, like mine, calls for weathering, physical sedimentology, siliciclastics, and carbonates to be covered in the first 6-8 weeks of class; evaporites follow well after carbonates). The final lab report is not due until the end of the semester so that all students have time to bring their expermient to completion, make interpretations, and write their lab report. At the end of the semester, depending on the number of students and time permitted, I ask the students to informally tell the class about their experiment and show the results. This has worked well for me. However, even in semesters in which we have not done this, the students still become familiar with each other's projects. On the initial experiment day, the students informally share their ideas. As students come to check on their own experiiments periodically, they usually look in on their classmates' experiments as well. Students tell me that this is one of their favorite lab exercises. It encourages critical thinking and shows the importance of experimentation in science. In addition, I feel as if the students leave my course knowing more about evaporites than the average geologist.